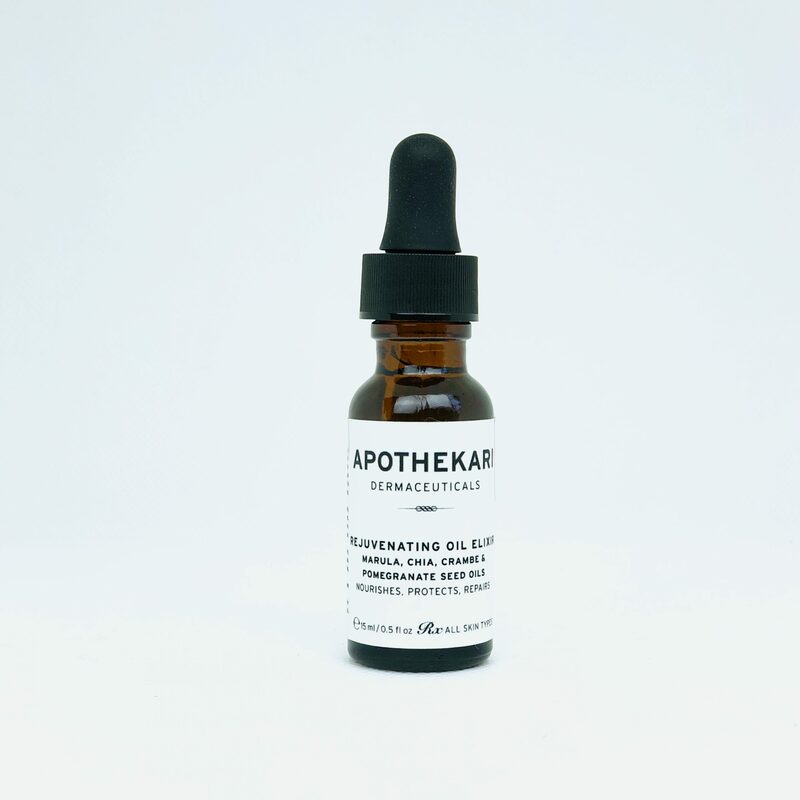 Apothekari Rejuvenating Oil Elixir (15 ml/0.5 fl oz). Limited Edition. Just in time for the cooler temperatures and lower humidity, Apothekari Rejuvenating Oil Elixir is here to save the day. Featuring over 94% Olkerii Marula Oil plus other skin nourishing vegetable oils – chia, pomegranate seed and crambe seed – plus essential oils, this oil elixir delivers fatty acids, sterols and antioxidants to calm, heal and protect skin. It is formulated to promote soft, radiant skin, protect skin from dehydration, while encouraging skin rejuvenation and reducing inflammation. It is fast absorbing and suitable for all skin types. Ideal for dry and dehydrated skin. Olkerii Marula Oil. Comes from nuts harvested from trees that grow wild across East Africa from Kenya into Tanzania. Inside the shell is a delicious edible fruit that contains high amounts of vitamin C as well as other antioxidants. The fallen fruit is harvested by women, who remove the nuts and use them to make juice, jams, and a delicious marula liqueur. Once the fruit is removed, the nuts are sun dried. To get to the oil-rich kernel, the nut casing must be cracked and the kernel carefully inspected and separated. This difficult job is done by hand-cracking each shell. The shells are very hard and the kernels are small. The kernels are then processed in small batches by pressing and filtering the oil using high quality presses and filtering equipment to ensure quality and sterility. Marula oil contains between 70-78% monounsaturated high-oleic acid along with potent antioxidants, some of which have yet to be identified. It is highly stable and has significant healing properties. Chia Seed Oil. Contains polyunsaturated fatty acids including 15-25% linoleic acid and 60% alpha linolenic acid to maintain moisture in the skin. The high content of essential alpha-linolenic acid provides a vegetarian source for the body`s own EPA and DHA synthesis. Pomegranate Seed Oil. A fatty oil with a high concentration of punicic acid, a valuable conjugated linolenic acid. Furthermore the extract contains tocopherols, sterols and a small amount of squalene. It is used for promoting skin regeneration, stimulating self-repair mechanisms, improving skin elasticity, reducing wrinkles and as prophylaxis against skin aging; calming and healing properties in case of irritated, dry, sensible, and allergic and itching skin. Crambe Oil. Consists of 55-60% erucic acid, a monounsaturated omega-9 fatty acid very beneficial to the skin. It is excellent oil for skin protection from dehydration. Ribes Nigrum (Black Currant) Seed Oil, Cardiospermum Halicacabum Flower/Leaf/Vine Extract, Tocopherol. This combination is a soothing, anti-inflammatory complex used to aid aid sensitive skin by protecting and replenishing the damaged skin barrier, reducing allergic reactions, reducing tissue damage resulting from mosquito bites, soothing the skin after shaving and epilation, and helping to alleviate atopic eczema. Essential oils. Selected for their calming and nourishing properties and to provide a delicate scent. Rejuvenating Oil Elixir is best used after cleansing, gently massaged into face and neck, to protect skin from dehydration, while encouraging skin rejuvenation and reducing inflammation. It is fast absorbing and suitable for all skin types. Massage into skin with circular, upward strokes, paying special attention to the jaw, cheek bone, temples, and brow line. Ideal after aggressive treatments or as a nightly moisturizer. Try applying it after Apothekari Daily Infusion Moisturizer (AM or PM) or Apothekari Bespoke Vitamin C Serum (AM) or Apothekari A is for Anti-Aging Serum (PM).